Keeping to the challenge of using 5 ingredients for a pasta dish, here is my next creation. 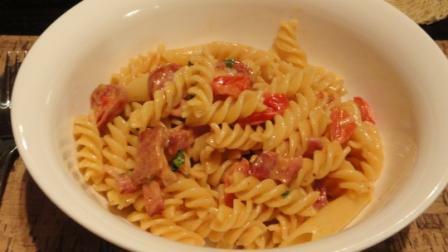 This week I made Pasta with Bacon, Chorizo, Tomatoes, Cream And Parmesan. Bacon is my favourite condiment and a staple ingredient in my fridge. The chorizo comes from a local sausage maker up the road from where we live. You will also always find tomatoes in my fridge. I love Parmesan and try and bring some back from Italy with us. If not I use a local hard cheese which has a similar texture to Parmesan. But nothing can beat the flavour of the real item. One of my child’s fave meals. Enjoy the long weekend Tandy.